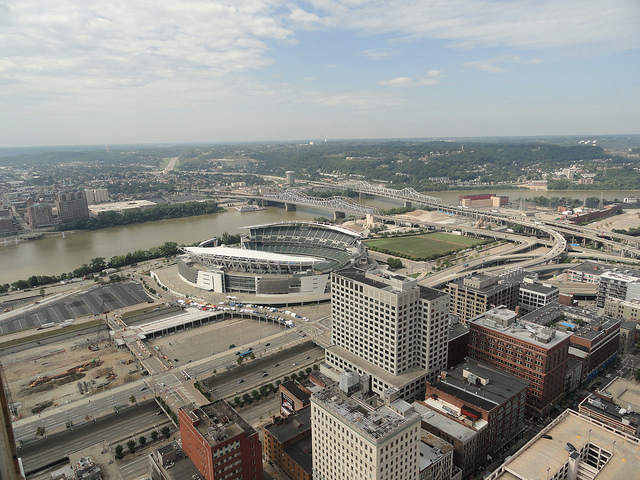 Through its history, Cincinnati has seen a typical evolution of urban sports venues for American cities. The intersection of Findlay and Western, in Cincinnati’s West End neighborhood housed the Cincinnati Reds from 1864 through 1970 in three iterations of ballparks — League Park, Palace of the Fans, and Crosley Field — until the team moved with the Cincinnati Bengals football team to Riverfront Stadium. The Bengals also spent their first two years playing at Nippert Stadium on the University of Cincinnati’s campus uptown. But when the two teams moved to Riverfront Stadium, they followed a national trend of cookie cutter stadiums in urban environments meant to serve as economic development generators. The problem was that the promise never came to fruition in the cities that went after the golden egg. Most of those same cities have rebuilt their professional sports venues, many in the urban core. But the question still remains whether the return on investment is worth the valuable land for these lightly-used behemoths. In Cincinnati, the Reds host more than 81 games every year drawing tens of thousands of fans to each event. Additional events are held at the ballpark, and its related attractions, throughout the year that also create a draw. Four blocks away, Paul Brown Stadium, home of the Bengals, hosts 10 games each year in addition to the smattering of high school events and concerts held there annually. The result is a larger football stadium with far fewer events and a ballpark with more events but smaller crowds. The winner in this case is the ballpark, and the new generation of urban ballparks appears to be as successful as the original wave of urban ballparks in the late 19th century. The problem with urban football stadiums can be both a structural issue and a programmatic issue. In the case of Paul Brown Stadium it is more about the program. The large, tailgating-bound crowds demand available parking for their pre- and post-game festivities. 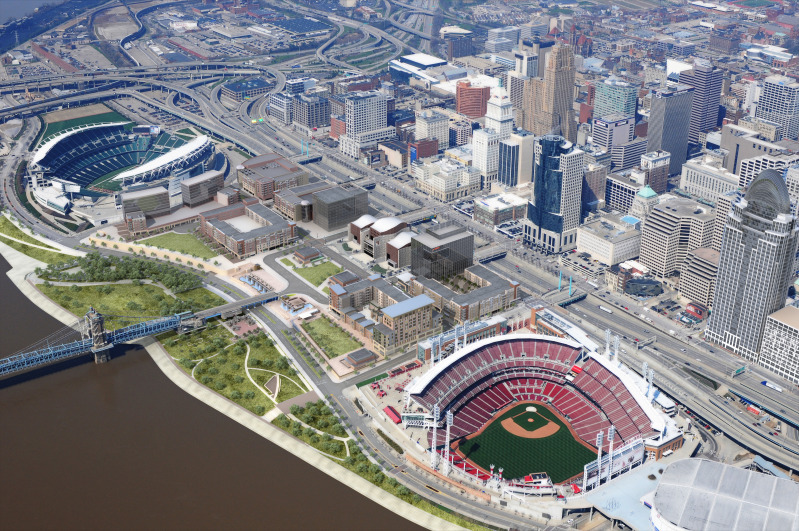 In Cincinnati, developers are currently constructing The Banks, a mixed-use urban entertainment node wedged between Great American Ball Park and Paul Brown Stadium and will eventually house thousands of new residents. Before each phase of development begins, it must first have two-floors of underground parking built before it even begins to satisfy the parking demands for the new residents and workers to be housed above. Once complete, The Banks may set the stage for a truly unique urban sports and entertainment area, one that would have no surface parking and force tens of thousands of sports fans, visiting the area, out onto the streets for live music, food, drink, and festivities. This may end up being Paul Brown Stadium’s saving grace. The beautiful thing about professional sports venues is that they can turn what is otherwise worthless land into something economically productive and thus improve land values in nearby areas. But most often franchise owners often want their venues to be located in prime real estate so that they can maximize their visibility. In Cincinnati that meant handing over prime waterfront property to two large concrete masses that only stay active a fraction of the year. When other cities examine plans for an urban sports venue of their own, they should keep more in mind than the wishes of the franchise ownership and the promise of skyline shots on national television once or twice a year. Less is more. You want the venue to blend in so that it does not detract from its surroundings when it is inevitably non-active. You want the venue to be versatile so that it can serve other functions beyond that of playing baseball or football. And most importantly, get rid of the parking so that venue’s support facilities do not kill what you want the venue to create — economic development. Paul Brown Stadium aerial photograph provided by UrbanCincy contributer Thadd Fiala.